After parents have homeschooled their children for a few years, they often suffer from something we might call routine-itis, which we could define as an overall sense of malaise that takes place from doing the same thing day after day. Like the cough and cold, routine-itis is much easier to develop in winter as parents and students can begin to feel cooped up in more ways than one. If you are one such parent, I want to make a movie recommendation to you (along with the boilerplate moral caveats and conditions that accompany the recommendation of just about any film produced since 1919). It is called Groundhog Day. (Spoilers ahead.) 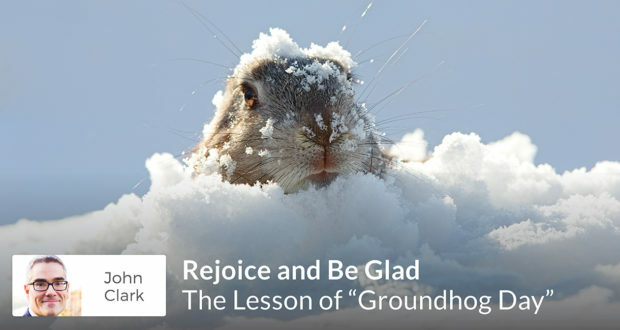 The movie tells the story of a self-centered and cynical weatherman named Phil Connors who is forced to cover the Groundhog Day events in Punxsutawney, Pennsylvania, at which a groundhog emerges from a hole and “predicts” how severe the remaining days of winter will be. Connors would rather be anywhere else, but begrudgingly covers the story for his TV station. He goes to bed that night, glad that the Groundhog Day events are behind him. Yet something strange happens. When Connors wakes up, it is Groundhog Day again, and the exact same events happen. And it happens again. In fact, he lives the same day over dozens, even hundreds of times. He knows what everyone will do and say. Next, as he realizes that nothing he does matters into the next day which never comes, he’s excited at the prospect of living the same day over and over. He can commit plenty of sins like anger, greed, and gluttony with no lasting effect. He can eat piles of donuts, rob banks, and assault people without a worry in the world. “I don’t worry about anything!” he assures his friend. He can treat people terribly and they won’t remember. But he comes to realize that the deadly sins are not just deadly but terribly boring. And the commission of all these sins leads to another sin: the sin of despair. He thought that the sins would make him happy, but instead, they make him miserable beyond comprehension. In the midst of his despair, his friend Rita mentions that the ability to live this day over and over might be a blessing. Up until then, he never seems to have considered that he could use the day to help people, so he tries it. When he uses the day to help people, he is surprised to realize that this makes him happy and fulfilled. As he lives Groundhog Day over and over now, he does more good each day. Whereas the world was once a place filled with people he scorned and ridiculed, he begins to look at the world as a place filled with lovable friends worthy of his attention and charity. Connors realizes that he can accomplish great good. He goes from caring about no one to caring about everyone. He learns that loving and caring for others is the best way to spend the day. And he discovers that maybe he is worthy of being loved, too. I think it’s fair to say that homeschooling can be a bit like Groundhog Day, insofar as each today can seem so eerily similar to each yesterday. But maybe that’s what is so great about it. Psalms tells us, “This is the day that the Lord has made; let us rejoice and be glad in it.” Rejoice and be glad. That doesn’t sound like such a terrible mission. If all you see is monotony, ask God to help you see how you are called to rejoice today, how you are called to be glad today, the good you are called to do today. Two of our children have grown and moved out and a third is about to graduate college soon. Everything is happening so fast. I long for the days when I have what I once had every day: all my children under one roof. What I can tell you after twenty-five years of homeschooling is this: there will come a time when you will miss these groundhog days. You will miss the days of home and hearth when you pour hot chocolate for yourself and your daughter and teach her to sound out consonant blends. You’ll miss helping your little son with the times tables. You will miss conversations with little children.